Put 19 dots in the center - leave one dot at both ends and put dots at both sides and stop at 1 dot. Join dots as shown above. Erase the left out dots. Hi, All your kolams are beautiful and there are many new designs too. The no. 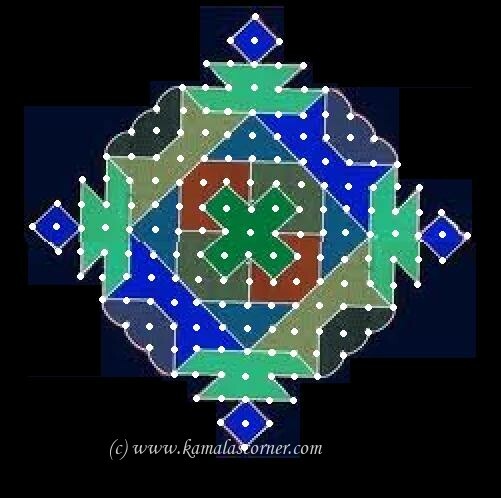 of dots of this kolam(Kolam no.8) is 10 to 1 interlaced dots but it is given as 15 to 1. Please change it for helping the others. Thank you for visiting my blog and your comments. I also sincerely thank you for pointing out the error in dots count which is a typographic error. I have corrected it now.